The Plains, one of the first titles in the Text Classics series, is a short novel written back in 1982. It follows a man who ventures into inland Australia to explore ‘the plains’, an undefined area away from the noise of the east-coast cities. His reason for visiting the interior is to work on a film, a piece which will capture the splendour of the wide-open expanses, and after a short period of adjustment, he meets a group of local landowners, whose patronage is vital if he is to be able to work on his project. Things are very different on the plains, though, and time passes differently to how it moves in ‘Outer Australia’. As the days pass, we suspect that there is very little chance of the film ever being finished, the man’s lengthy stay reaching epic proportions. Still, the longer he works on his project, the more he realises that the plains are worth studying – even if he’ll never be able to understand them completely. And that, ladies and gentlemen, is pretty much the whole plot of The Plains – if you’re the kind of reader who likes things to, you know, happen in a novel, then I’d advise you to cut your losses here and go and find something else to do. This is a work which moves at its own pace, a novel which, while it might be interested in may things, has little time for a reader who isn’t prepared to settle down and forget the call of the outside world for a while. At times, the novel takes care in its description of the outside environment, the lengthy, unhurried passages contributing to the leisurely pace of the novel. This idea of hostility to the big cities and ‘Inner Australia’ as a true nation might seem far-fetched, but it really is a different world away from the East Coast (Western Australia, for example, the large state on the other coast of the continent, often sees itself as a very different entity to the rest of the country…). Putting aside the disputes with Outer Australia, though, life passes slowly on the plains, frustratingly so for anyone hoping to get things done. The filmmaker’s wait for an audience with the landowners takes much of the first part of the novel, and his days in the landowner’s private library (mostly spent gazing out at a restricted view of the plains) pretty much fills up the rest of the book. In fact, the more you think about The Plains, with its nameless characters, the futility of the main character’s quest, with a film never to be finished, the more other writers’ work comes to mind. The Plains is a beautiful, understated piece of writing, a relatively short book, but one which leaves the reader with a lot to think about. Quite apart from deciding which of the rival camps to side with on the question of the beauty of the plains (does it lie in the vast, endless horizon or the microscopic detail of ears of wheat? ), we are asked to contemplate the idea that possibilities are more important than achievements. You see, when things are achieved, the other possibilities disappear (which again hints that the man’s film is highly unlikely to be completed…). Tony: I wanted to read more Aussie lit & found Text. I have a few review copies from them and bought several too. It's great to see Aussie lit having a go at the US market. 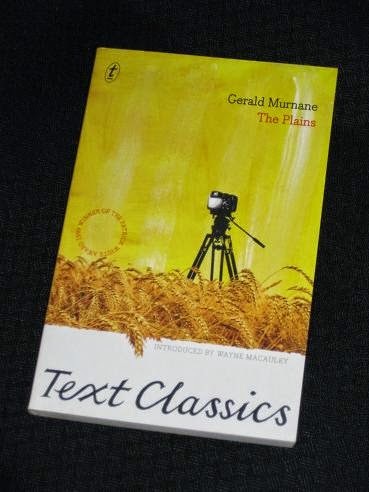 The Plains is the Murnane novel that I need to revisit at some point in the near future. When I first read the book I could not escape the feeling that relevant stuff was lost on me as someone who has never been to Australia… Check out the Murnane issue of Music&Literature, it is worth your money. Great review, Tony. I think there’s a lot to unpick in the novel. In some ways it’s a kind of satire and taking the mickey out of the “coastal dwellers” who think they have a monopoly on art and culture and that interior Australia is just empty space. I like the way he plays with the ideas of snobbery and class. And how there’s an unspoken kind of hierarchy within the arts… with writing at the top!